As a big fan and frequent competitor in off-road racing, the Dakar rally is something I’m very keen on. Not because I’ve ever got close to the competitive levels this monster rally brings, but because it is quite easily the biggest and most demanding off-roading experience in the world. 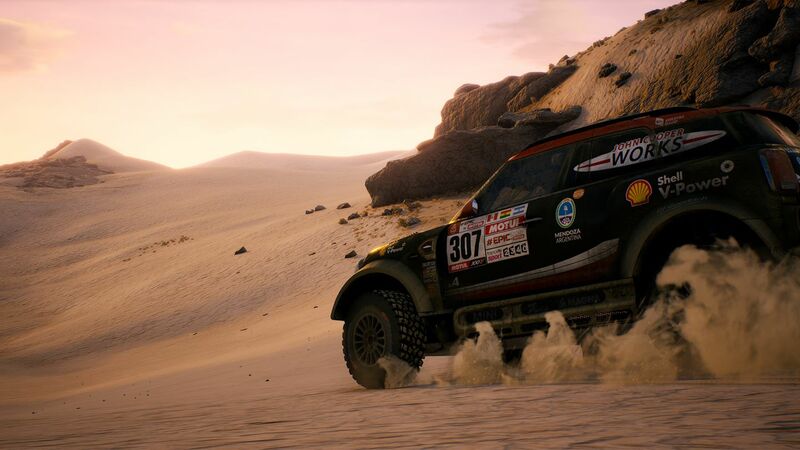 With more than 15 years passing since the world of Dakar last made an appearance in the gaming world, can Bigmoon Entertainment’s first foray into the world of motorsport bring the start of a fresh and revered yearly franchise? But more importantly, does it capture the true Dakar experience? In short – the answer to that would be yes if you can ignore the issues. 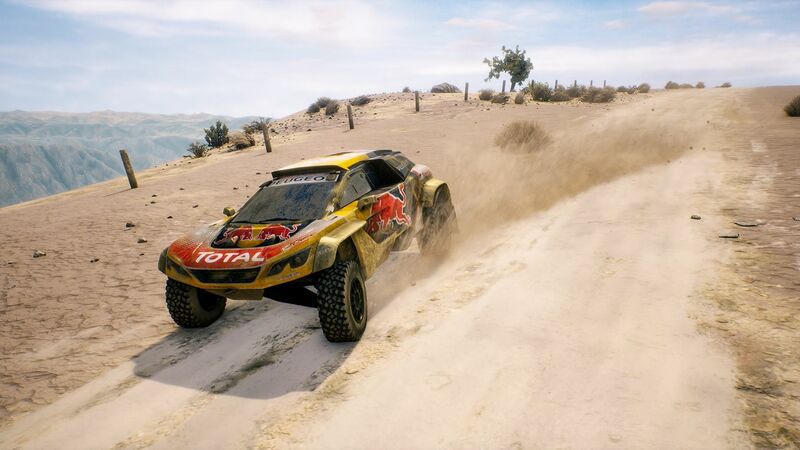 See, Dakar 18 does have moments in which it provides the unforgiving, lifelike experience that demands the very best from players, all as they navigate the many thousands of square kilometres of tough terrain on offer, but it’s not exactly the perfect racer either and there are some glaring issues that must be addressed should Dakar hope to keep players in for the long haul. From the start you have access to multiple game modes found within three hubs on the main menu. 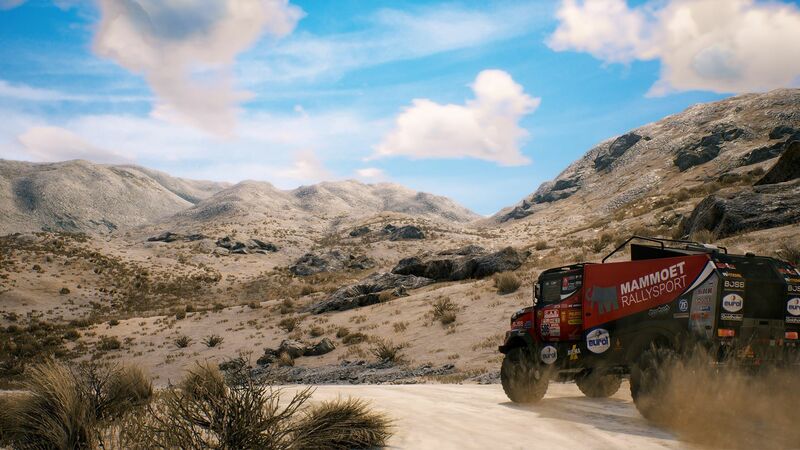 Adventure is essentially the Career mode and takes players through the 14 stages of the Dakar Rally, Multiplayer brings online and split screen play into the action and Explore lets players dive in with the Tutorial, Training modes and the unique Treasure Hunt in which players are able to explore each level freely to find seemingly random collectibles – a questionable inclusion if ever I saw one. When booting up for the first time however, you’ll immediately be taken to the game’s tutorial. If you’re looking to Dakar 18 as a casual game that will scratch an off-road itch, then be warned, Dakar 18 isn’t something to take lightly; something that’s proven within the opening tutorial video. This is where players are given a vast and in-depth explanation to the Dakar Road Book – the in-depth guide to each rally that is broken down to notes to guide you through the dusty sand traps and daring dunes all the way to the finish. Whilst the road book itself isn’t all too simple to follow, the overall objective of each race is and we see this broken down by three simple components; your distance marker, a landmark and the CAP – which is essentially the direction you’re supposed to be headed to get to the next checkpoint. You’ll need to pay attention to all of these, as well as the words of your co-driver should you be unlucky enough to have one. There are five different vehicle categories within Dakar 18 with Cars, Trucks, Quads, Bikes and SxS all available. Dependant on which vehicle category you run with, you will either go it alone or have the joys of a co-driver whose job it is to read out the directions of the Dakar Road Book, guiding you towards your destination within each gate. In most rally games, the idea of no co-driver is an unthinkable one, but in Dakar 18 it’s more of a godsend should you not have one thanks to the unnecessary anger that stems from making the slightest mistake. Whilst the notes that are read out do a fantastic job of creating an understandable path through the vast open world stages, the lack of a supportive partner to help out hardly makes the experience an enjoyable one. Turn a vehicle more than a second after a new direction is given and you can expect shouting. Try to make up time with a crafty shortcut, expect more. Genuinely make a mistake that sends you slightly off the chosen path and expect nothing but the looming sense of disappointment as your co-driver points out that you are now lost, refusing to give any useful advice on how to get back on track or letting you know when you eventually are. Of course, if i had been doing terribly, this wouldn’t have been something unexpected, but given Dakar 18 is a game that looks to bring a realistic experience to proceedings via way of weighted vehicles, challenging terrains, simulation handling, and no obvious path to follow, it’s not odd to see your vehicle slightly off the from the CAP for a few seconds. What makes it worse is should you be between checkpoints with some distance between them, it can be hard to know if you’re going in the right direction or not until the co-driver pops up, and unless it’s to give a new direction, the only time you can expect to hear from him and his rigid notes is when you’re off on the wrong path… and that doesn’t help when you’re trying to chase down first position. Whilst the navigation is a big issue in Dakar 18, it isn’t the only reason I have been left questioning things, with the decision to include aiding A.I. competitors who find themselves in a spot of bother, a strange one. You see, should you come across a vehicle stuck in the mud during your travels, it is entirely possible to stop your vehicle, get out and winch them to safety, before getting back in and carrying on. Doing so however seems absolutely pointless with A.I. drivers never returning the favour and nothing but additional time being clocked up for your efforts. In a game in which your final time is what decides your position, it seems utterly pointless to allow such a feature if there isn’t any true benefit to proceedings and whilst there is the mention of potential benefits throughout the game, I’m still yet to see one. Of course, it’s not all doom and gloom and should you look past the early issues there is a game in there that can be enjoyed. The many tracks and environments are a joy to race through as you cut through the vegetation and over dunes, whilst the various terrains such as rocky roads and sandtraps are a blast to navigate. Even the vehicles themselves are fun to drive with a great sense of realism on the handling and an accurate feel to the weight of each vehicle. 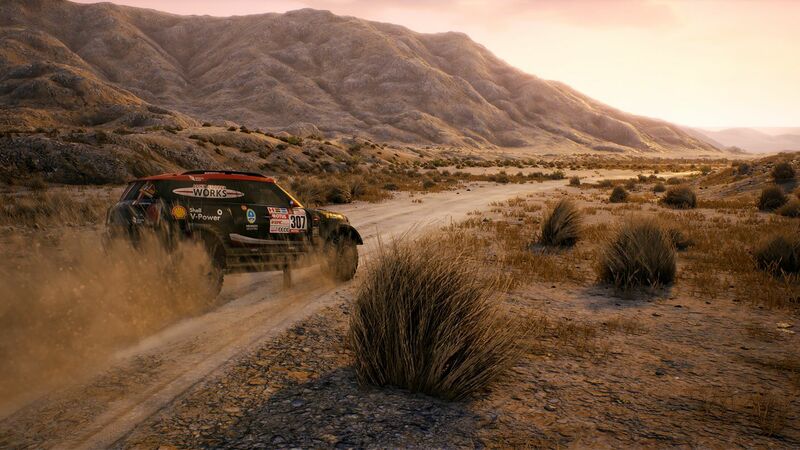 But just as we get to the good stuff, unfortunately there is one other major disappointment for a game that holds the official license for one of the biggest names in Rally, and that is the visuals. From trees and mountains that just pop in unannounced, vehicle liveries that load with each race start and textures that often blend together instead of loading correctly, it’s clear that Dakar 18 isn’t the best looking title you’ll play this year. This can of course be pointed towards the smaller budget on hand for Bigmoon Entertainment, but it would have been nice to see some jaw dropping visuals accompany the trips through Peru, Boliva and Argentina, especially when the game is backed by the power of Unreal Engine 4. Should you manage to avoid the many visual issues with Dakar and find yourself racing the correct path through each stage though, then Dakar 18 is genuinely a fun racer that can prove rather exciting, especially as you pass the muddy open areas and vast valleys in a fight with the terrain for first place, with rain and thunderstorms hitting midway through a stage to throw a spanner in the works. These moments are few and far between though and thanks to numerous issues sticking around even a few weeks after release, it ensures Dakar 18 isn’t ever up there with the best racers you’ll play this year. Dakar 18 isn’t a terrible game, but in its present state it does suffer from some rather unfavourable issues. With a navigation system that fails to allow for any true enjoyment, tying players to a strict path, buggy visuals, and a co-driver that screams at the first opportunity, it’s hard to say Dakar 18 reminds us of the exhilarating experience we’ll find on TV each year. That said, when it goes right, the racing is certainly a joy to play, but the engagement is ruined with issues popping up on a frequent basis. With a £50 price point, Dakar 18 is far from the ideal experience we’d hoped for on its long awaited return to gaming.